Ms. Sternback initially began her litigation career representing personal injury clients in both New York and New Jersey courts. This multistate practice included various court appearances and depositions. She also worked for several years with the New York City Housing Authority gaining experience in their administrative hearing unit. 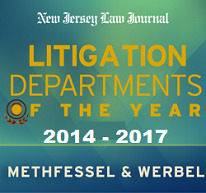 Since joining Methfessel & Werbel in 1996, Ms. Sternback has become certified, and re-certified, by the New Jersey Supreme Court as a Civil Trial Attorney. She is also a member of the New Jersey Defense Association. Ms. Sternback has broadened her litigation experience in all State Superior Courts from Atlantic County to Bergen County. Ms. Sternback has successfully handled over 1500 cases for the firm throughout the years from inception through to its conclusion. She has over 20 years of litigating experience with more than 50 jury trials taken to verdict including claims of injury ranging from herniated discs to fractures requiring surgery to traumatic brain injuries. She has examined and cross examined experts in areas of Orthopedics, Neurology, Chiropractic, Pain Management, General Engineering, Biomechanical Engineering, Economics, and General Internal Medicine. She not only handles the defense at the trial level, she also handles any appeals necessary for her cases with numerous arguments before the Appellate Division. She specializes in the defense of liability matters on commercial and residential property as well as defending motor vehicle accident claims for personal and commercial vehicles. Additionally, Ms. Sternback has participated in seminars for the various insurance companies on a number of topics ranging from defending automobile injury cases and PIP claims to lead paint and mold issues as well as seminars for the New Jersey Law Center and The Insurance Council of New Jersey.